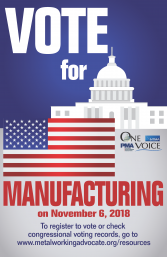 One Voice encourages its members to invite members of Congress, candidates and other government officials to their manufacturing plants to learn more about the industry, the business, and meet your employees. One Voice regularly helps arrange plant tours, CEO roundtables, town halls and other events for manufacturers to connect with their government. Please click here for more information on how to request your Senator or Representative attend an event or visit your facility and contact One Voice for help on submitting your request. For more background information to prepare for a visit click here. Below are additional resources to help One Voice members and small medium-sized manufacturers to access government and other information. Click here for more information from One Voice on Exporting. Click here for more information on NTMA's Purchasing Fair.